Glenn Ashby is currently in the Netherlands to participate on the A-Class Dutch Nats 2015, he will be racing a DNA like at Bordeaux Euros & Takapuna Worlds 2014 , as a preparation towards Punta Ala Worlds in 3 weeks. 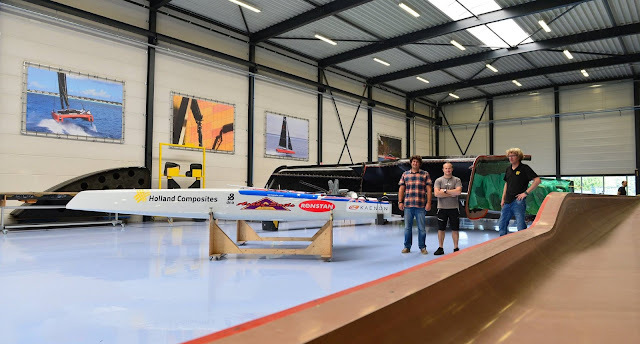 The boat on the pucture at Holland Composites (builders of the DNA A-Class) being laminated of course is not an A but the 2nd Gunboat G4 hull. I'm waiting for some updates from PJ & Peter on the G4 project, but as we are seeing here another one is being built. More info soon.